Fresas con crema! This creamy strawberry flan topped with fresh whipped cream is the perfect chilled dessert for your next outdoor party. 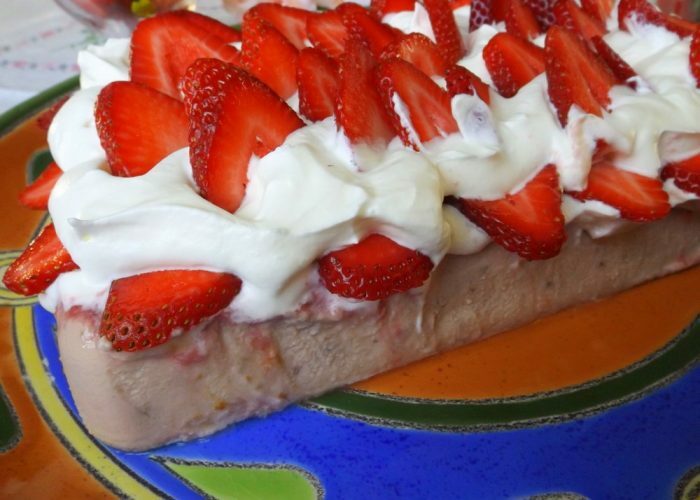 Strawberries and cream on a cake is delicious! 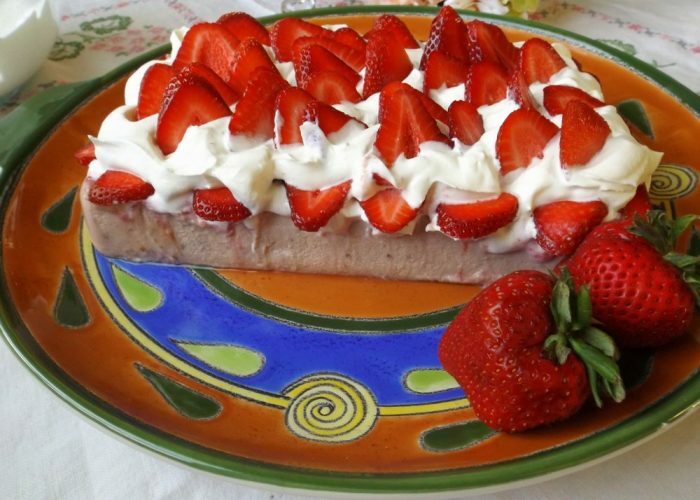 But strawberries and cream on this strawberry flan is the perfect chilled dessert! Strawberries are ripe for the picking right now, and I could not think of a better way to enjoy them. My dad's favorite desserts were any that included strawberries and cream. He would love this strawberry flan loaded with fresh strawberries. I always try to cook with the fruits that are in season. This will yield a more tasty recipe to share with your family and friends. Check out your local farmers market for the freshest pick! 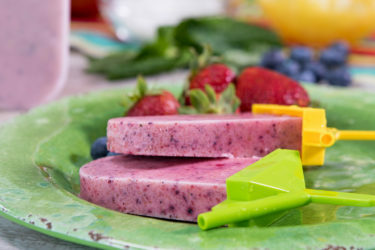 In the blender, combine evaporated milk, condensed milk, sour cream, eggs, orange juice, vanilla and 2 cups fresh strawberries. Blend on high until smooth. You will need a square or round baking dish that can hold 7 cups of liquid. Add the strawberry topping to the bottom of baking dish and spread out evenly. Pour flan mixture from the blender slowly over the top of strawberry topping. Place the filled baking dish in a larger baking dish that is filled halfway with warm water. It will be very heavy at this point, so carefully transfer into preheated oven. This large flan takes about 1 hour and 35 minutes to bake. But, all ovens vary. The flan is ready when it's just a little jiggly in the center, like a firm Jello. When ready, remove the flan from the oven. Wait 5 minutes before removing the flan from water bath. Place onto cooling rack and let cool for 30-40 minutes. 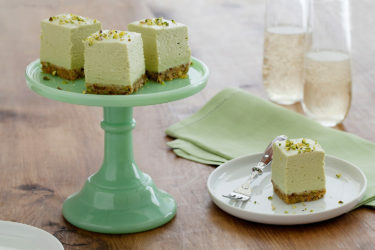 Find a platter or plate that can fit your flan. 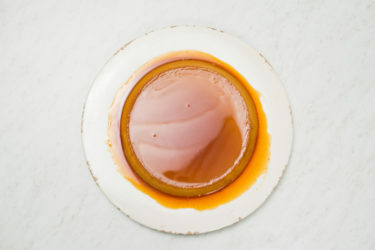 Using a small straight-edge knife, loosen the sides of flan from baking dish. Place plate or platter over the baking dish with flan and using both hands, quickly flip it over so platter is on the bottom. Let it sit for a few minutes before you attempt to remove baking dish. Chill for few hours or overnight. Before serving, top with whipped topping and garnish with extra strawberries that have been sliced. Add the heavy cream and sugar to a bowl. Using a hand-held electric mixer, beat on high until thick peaks form. Cover and store in refrigerator until ready to use. My best tips for preparing large size flan is to make sure you have the right size baking dishes for the water bath step. Flan is best chilled for 24 hours.